“Swept source” refers to the type of laser incorporated in “Swept-source OCTs”. Instead of the super-luminescent diode laser typically seen in conventional spectral domain OCTs (SD-OCTs), swept-source OCT (SS-OCT) uses a short-cavity swept laser. Although the swept source laser has a wavelength centered around 1µ, the laser actually changes as it sweeps across a narrow band of wavelengths with each scan. 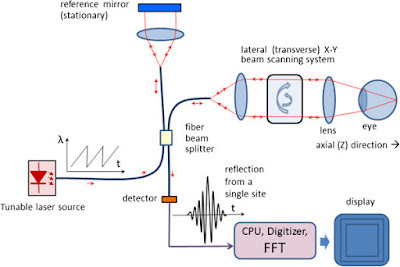 Like SD-OCT, SS-OCT has a fixed reference arm, but it does not use a spectroscope due to the tunable laser. Instead, a complementary metal oxide semi-conductor camera is employed, along with 2 fast parallel photodiode detectors. Thus, extremely high scanning speeds of 100,000 A-scans per second can be obtained. SS-OCT also has a high axial resolution of just 5µ and an improved signal-to-noise ratio. 1. High imaging speed: This allows high resolution images to be obtained while reducing the negative effect of patient’s eye movements on scan quality. 2. It uses an invisible light which is less distracting to patients, compared to the visible light used in SD-OCT.
3. The long wavelength and swept-source technology provide the ability to obtain clear images of deep ocular structures such as choroid and lamina cribrosa which is the probable site of axonal damage in glaucoma. 4. 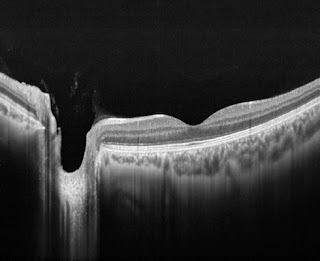 Imaging of deep structures is possible as the long wavelength of SS-OCT is less subject to light scatter by the retinal pigment epithelium (RPE). There is less light scattering by lens opacities, therefore, SS-OCT can provide clearer images in patients with cataracts, compared to conventional OCT.
5. SS-OCT provides uniform sensitivity over the entire scan window, which enables the vitreous, retina and deep ocular structures to be visualized in a single scan. In comparison, conventional SD-OCT does not have the same capability and suffers a drop off in sensitivity with changing scan depth. 6. Placement of a peripapillary circle is not required with the wide-angle scan. In eyes with an atypical optic disc configuration, such as those with tilted optic discs or extensive areas of peripapillary atrophy, placement of the peripapillary circle can be challenging due to difficulties in delineating the optic disc margins. 7. 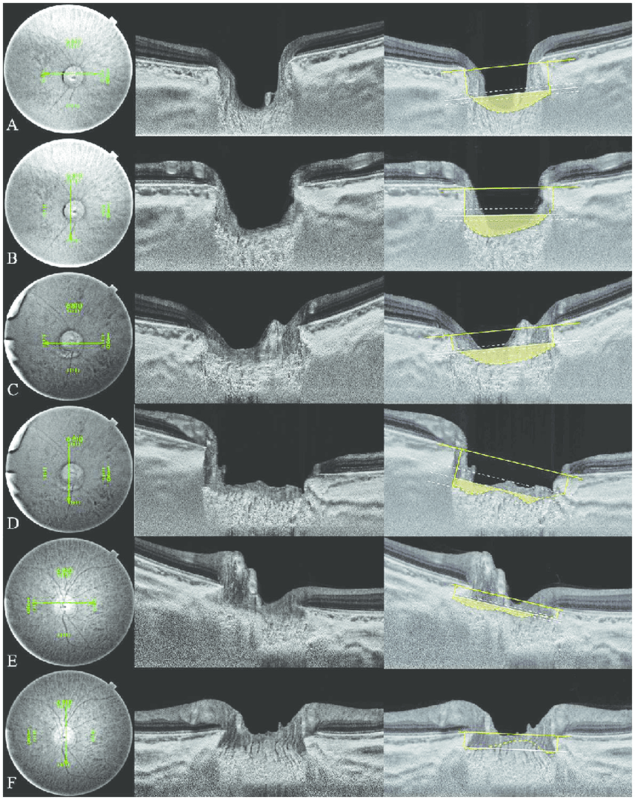 The SS-OCT is less susceptible to artifacts that may affect the peripapillary circle measurements, such as those produced by floaters, localized scars or extensive peripapillary atrophy extending to the region of the circle. 8. Due to segmentation software incorporated in the machine, segmentation of the retinal ganglion cell layer (RGC) and inner plexiform layer (IPL) thicknesses across the entire 12x9mm scan is possible. It may provide a means for direct single-scan structure-structure comparisons of peripapillary and macular retinal layers. Topcon’s Deep Range Imaging OCT-1 (Atlantis) can perform a wide-field scan covering a 12x9mm area of the posterior pole. Therefore, the disc and macula can be evaluated in a single scan. The DRI-OCT uses a center wavelength of 1050µ and a sweeping range of approximately 100nm, compared to the fixed 850nm wavelength typical of SD-OCT. The instrument uses 2 parallel photodetectors to achieve a scan rate of 100,000 A-scans per second compared to 40,000 A-scans per second scanning rate typical of SD-OCT.
SS-OCT also incorporates automated segmentation software which allows identification of 7 different retinal layers. It is therefore possible to image the circumpapillary retinal nerve fiber layer (RNFL) and macular ganglion cell layer (GCL) using the same scan. The segmentation software also identifies the internal limiting membrane (ILM), IPL, inner segment-outer segment junction (IS/OS), retinal pigment epithelium (RPE), Bruch’s membrane and choroid. Multiple thickness maps can then be generated. Possible applications of SS-OCT in glaucoma include: disease detection; identification of novel risk factors; improving the understanding of disease mechanisms. 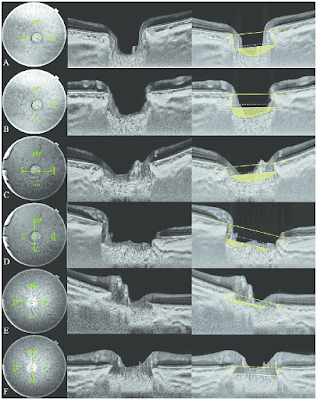 In a study conducted by Yang et al, the diagnostic ability of both the wide-angle and peripapillary RNFL thickness measured with SS-OCT were similar to that of peripapillary RNFL thickness measurements obtained with SD-OCT. The average global RNFL thickness measurements acquired by SS-OCT wide-angle scans were thinner than that for peripapillary RNFL scans. This is assumed to be due to more axons in the peripapillary area compared to other areas scanned by wide-angle protocols. However, compared to SD-OCT, SS-OCT had a faster image acquisition rate. 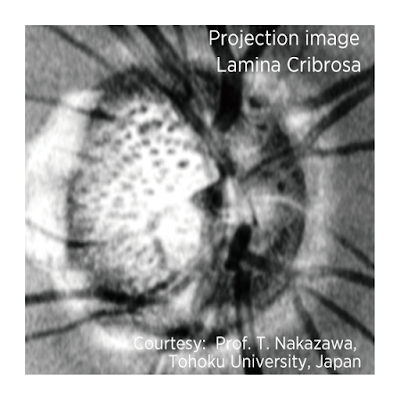 Other studies are being conducted to use SS-OCT in deeper assessment of the lamina cribrosa. SS-OCT is able to scan deeper into the optic nerve head, overcoming image acquisition difficulties due to overlying blood vessels and tissues. This could give us a new perspective on glaucomatous changes in the optic nerve head. 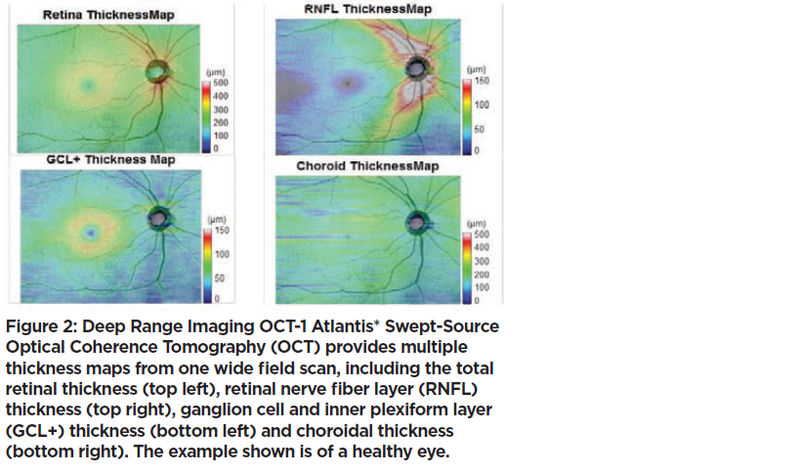 Taken from the article by Yong et al, the above image shows representative swept-source optical coherence tomography (SS-OCT) B-scans of optic discs in high-tension glaucoma (HTG), normal-tension glaucoma (NTG), and healthy eyes. Horizontal (A, C, E) and vertical (B, D, F) optic disc scans of HTG (A, B), NTG (C, D) and healthy eye (E, F). The image delineated with yellow guidelines is the same as that depicted to the left. 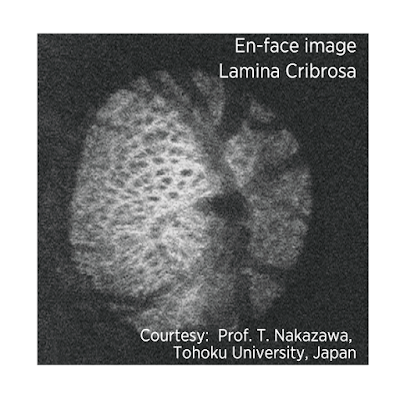 The area shaded with yellow depicts the degree of posterior bowing of the lamina cribrosa (LC) according to the level of anterior laminar insertion depth (white solid line). 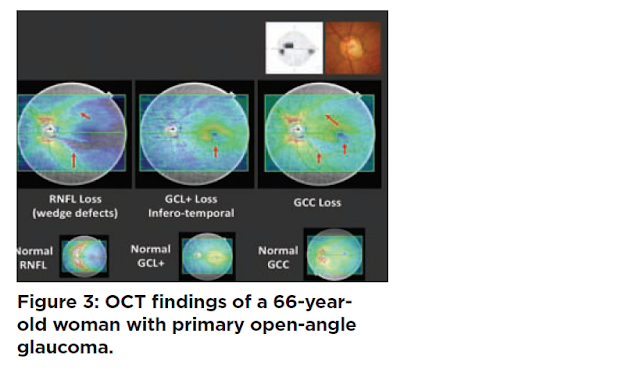 (A, B) Optic disc scans of 65-year-old male with primary open-angle glaucoma (POAG). His baseline intraocular pressure (IOP) was 45 mmHg, and his IOP at examination was 11 mmHg. The overall anterior laminar insertion depth (ALID) was 381.8 μm, the overall mean LC depth (mLCD) was 484.4 μm, and the overall LC curvature index was 102.7 μm. (C, D) Optic disc scans of 65-year-old male with POAG. His baseline IOP was 18 mmHg, and his IOP at examination was 13 mmHg. The ALID was 290.3 μm, the mLCD was 359.9 μm, and the overall LC curvature index was 69.6 μm. (E, F) Optic disc scans of healthy 46-year-old male. His IOP at examination was 13 mmHg. The ALID was 152.6 μm, the mLCD was 146.9 μm, and the overall LC curvature index was –5.7 μm. Thank you for appreciating it. Nice post. We all know that glaucoma is dangerous, causing blindness that cannot be reversed. But the fact that we don't know is, glaucoma can be diagnosed and treated at early stage and completely curable. Just adopt vision plans to reduce the cost of treatment.